Today we present the answers given by Commodore (R) Rubén Lianza, Director of the CEFAe, the official commission that belongs to the Argentinian Air Force. Rubén Lianza is a retired Commodore (equivalent to a US Colonel) with 30 (+) years of active duty in the Argentinian Air Force and an extensive experience as Military Pilot and Experimental Test Pilot with many deployments and demo tours to various countries including a 3 year assignment to Vought Aircraft in Dallas, TX (US) as Project Pilot for the JPATS Program. In 2004 he was selected as Station Leader of the Argentine Marambio Antarctic Station. 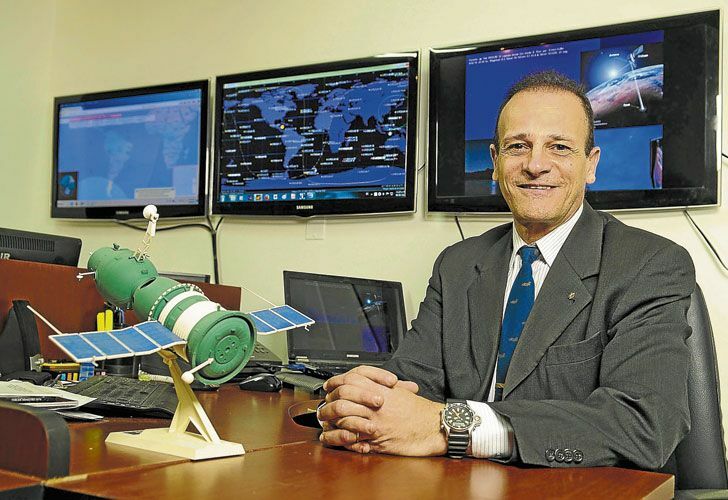 He holds a License degree in Aerospace Systems from Aeronautical Engineering Institute, Córdoba, Argentina. Upon 7 years into retirement, after considering his 40 years of quiet dedication to study Unusual Aerial Phenomenae, Lianza was recalled by the Air Force to lead a recently created Committee for Aerospace Phenomena Research. Answer: I use the UFO acronym as much as its Spanish equivalent, although in my latest speech at FIDAE (Chile) I proposed the acronym EFO (Extraordinary Flying Object) which is a more descriptive and assertive word rather than something that tries to "identify which is not identified". Answer: Actually not, I always regarded them as something not identified BY THE WITNESS at the time of the sighting, instead of the many attempts from Ufology "Popes" like Joseph Allen Hynek to distort the concept into those objects which defied any explanation BY THE INVESTIGATOR (I always wondered, by whom?, since I have seen cases unsolved by very well reputed Official Committees and Scientific Coalitions and shortly after I read about the same cases being explained. I myself have solved some cases which supposedly "defied any explanation" proving that they were just ordinary things. I find quite arrogant that hidden attitude of some researchers (official and non-official) in publishing unsolved cases as evidence of alien objects, thus transmitting the subliminal message that if they did not solve them, then no one else can solve them either. And as if that weren´t enough, they never publish the method by which they came to the conclusion that the case they published is definitely and absolutely "inexplicable". 3) Should the UFO investigator become an expert in IFOs?. Answer: Of course they should, it is absolutely mandatory. In Argentina, I met ufologists who published frames of old videos where a plastic bag transported by the wind was captured flying near an airplane. They directed most of their attention to the study of that flying bag as if it were a real UAP, but they failed completely to describe the brand and the type of aircraft that was flying next to it. I would have preferred not to name any aircraft to avoid making such an error. The moral of this is that if a child wants to learn to swim he does not want to dive into the deeper side of the pool. Starting from the shallow side is knowing each IFO before any researcher wants to "immerse" in the unknown. In other words, if you want to be a good Ufologist, you must first become a very good Ifologist. I do not know how MUFON or SCU train their "Researchers", but if I were them, I would teach "Ifology" instead of Ufology, because that will guarantee that their students quickly become true experts in separating the ordinary from the extraordinary. This new generation of researchers will know everything that flies or can be seen in the skies, even better than pilots since we pilots are only taught to fly an airplane, follow navigation rules, radio communications and some basic concepts about meteorology. But in principle we pilots should not be obliged to know what a strong laser beam looks like when it is projected through a layer of clouds and directly under another companion aircraft or how a recently deployed barium cloud for ionospheric experiments looks like, or the fact that all spacecraft have to vent their fuel tanks (in compliance with ISO 24113 standards) before re-entering the atmosphere. All this knowledge should be considered as the central competence of any Ifologist, regardless of what type of profession he/she had before having chosen to become a researcher. 4) If there were still some unexplained phenomenon, what could it be?. Answer: It should be just one thing: another "target case" that researchers should consider as a serious subject of study. With enough hard work, sooner or later they will find the explanation. The problem I discovered in most of the emblematic cases "without explanation", after finding their true cause, is that they were originated by a banal cause included among many others that the researchers had already quickly ruled out. I found numerous cases (if not all) in which the researchers wrote: "Every ordinary cause has been ruled out", a statement as precise as that of having also excluded THE true cause that originated the sighting. Answer: The fundamental problem in ufology is not an overall lack of scientific method, as at least a few honest and dedicated ufologists have striven to meet standards of scientific acceptability, but rather the fact that the assumptions on which their "research" is based, are considered highly speculative (Cooper, Rachel ) . They present individual testimonies as if they were conclusive proof. They do not fulfill Occam's razor strategy. They rather jump into the conclusion that unexplained = unexplainable (by everybody else), I think the whole issue about Ufology not yet being considered a Scientific discipline can be perfectly understood if we read Carl Sagan´s opinion about it: Sagan called Ufology a “Pseudoscience” for five reasons: 1) It lacks the study subject, 2) it leaves the burden of proof on others, 3) it presents persuasive arguments as though they were demonstrative ones, 4) it did not generate any new scientific knowledge and 5) some investigators do not seek to obtain new knowledge but personal financial benefits and/or mass media exposure. Answer: Rather than bringing them the truth I would first strive to bring them the reality. Unless they all believe that reality is also a b.s. hoax (like in the Matrix saga or decades before it: the bizarre theory proposed by Jacques Valée referred to as the Control System). Why bringing them reality instead of the truth?. Well, let´s overview some basic concepts: The truth is the distance between the human brain and reality. The smaller the distance, the truer the truth (even if it sounds like a tongue twister). So if their (the public´s) brains are not willing to approach reality, the only other way is bringing reality closer to them. But here we have to deal with an additional problem. The human brain has two ways of acquiring knowledge, which run sometimes overlapping and sometimes separate. One is the sensitive thinking, (which is the one that makes you fall in love, have faith in a religion, believe in politicians´ promises, etc.) which Plato used to call: "doxa". The other is the intellectual knowledge, which Plato named "Episteme". So to give you a clear and crude idea on how your brain works, when you fall madly in love with another person you are thinking "doxa" and after many years knowing how that person really is... just then... you are thinking "episteme". So if the "target public" you want to change the minds of are thinking the "doxa" way, you could convince them about everything, even about that the only way to get aboard an alien spaceship is by killing yourself... so see if "doxa" weren´t powerful enough as to people doing something so unthinkable as the Heaven´s Gate mass suicide as a mean to get on an alien ship. Unfortunately the desire for humans to get in touch with heavenly deities is such a strong feeling that I found that any effort to convince some UFO "believers" even though I brought them the best proof to show, will bring them such a void in their lives that it usually makes me wonder ¿why am I doing this?. So my wisest suggestion here is... "bringing the truth to the public is a very praiseworthy act but keep in mind that not all of them will think the ´episteme´ way, so stick to the intellectual type of people”. Answer: Even though it is a question that may trigger highly speculative answers, I would think yes, because even if SETI yielded no results whatsoever, at least we can think about their failure to receive radio signals must be due to some new hypothesis, like: 1) ETs are not transmitting, 2) they may be utilizing another band of the radio wave spectrum, 3) they are located so far away that whatever sign of transmission is fainter than the most sensitive human instrument can detect, 4) our nearest neighbours are very intelligent but live in underwater cities, covered by thick ice and have no idea on what outer space is all about..... and... if you want a more disappointing hypothesis: SETI might not be receiving anything... because there is simply nobody else out there with an industrial level. Perhaps there were some highly advanced civilizations, but they might have disappeared a long time ago. Answer: It simply blows my mind. But at least it gives Hollywood's scriptwriters a fresh argument for coming sci-fi movies! Next publication: the answers given by Leopoldo Zambrano Enriquez, Mexican investigator.